Barcelona’s title challenge upped a gear after a dominant 3-1 victory over Ray Vallecano at the Nou Camp. The home side were 2-0 up at half-time thanks to goals from David Villa and Lionel Messi and were crusing for an easy victory. The lead was widened when Messi added his 42nd league goal of the season and they went on to get three points, despite Raul Tamudo’s consolation strike for Rayo. Both sides made a slow start, with Vallecano the team who dominated the possession. Barcelona did get a shot away at goal from Adriano, but he ballooned it over the crossbar from thirty yards. With hardly anything happening inside the first twenty-five minutes, the home side grabbed a goal from nothing. Messi suddenly broke free of the Rayo midfield before playing in Villa, and the Spain striker expertly placed the ball into the top corner of the net. It was a splendid finish from the lethal hitman, and Barcelona were up and running. Just fifteen minutes later, the league leaders had a second goal. Villa returned the favour to Messi with a stunning through ball, and the Argentine fired into the bottom corner for his 41st league goal of the season. 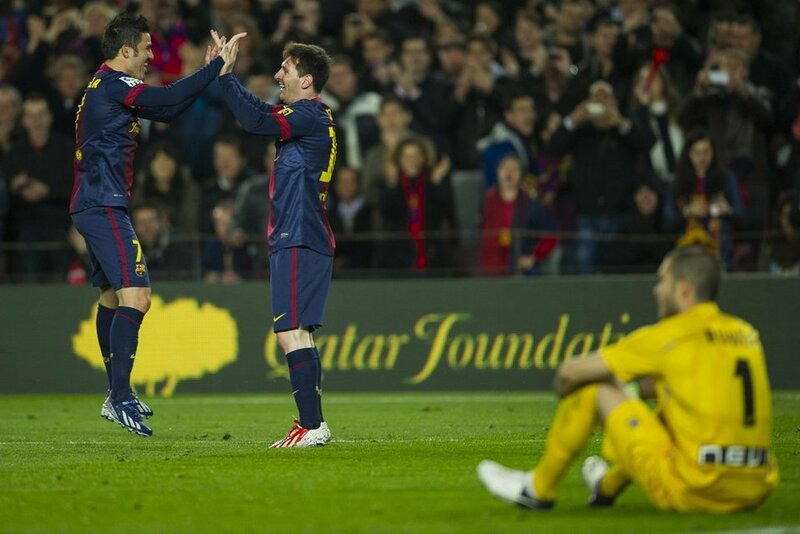 It meant this is the 18th successive game that Lionel Messi has played and scored which is a phenomenal record. With half-time approaching, Villa should have made it 3-0. Cesc Fabregas unlocked the Rayo defence with a fantastic pass, but the former Valencia striker only managed to poke the ball wide from ten yards and the chance to kill the game passed Barcelona by. The interval brought an end to a half which the Catalans had not been anywhere near their best, but showed the lethalness needed to race into a two-goal lead. Rayo looked down and out already. It was more of the same from Barcelona in the second half. Andreas Iniesta was pulling the strings, and when he found the unmarked Dani Alves, the Brazilian substitute flashed a shot at goal that clipped the post and bounced away for a goal-kick. It was unlucky on the former Sevilla man, who has only scored once this season which was a Champions League goal against Spartak Moscow. The Barcelona pressure continued and Alexis Sanchez wasted a glorious chance to add his name to the score-sheet. After Messi went past two defenders and slid the ball wide to Alves, the full-back’s low cross fell to the Chile international but Sanchez shot wide from six yards, with the goal gaping. It was up the club’s top scorer to show Sanchez how it is done, as Messi grabbed his second of the night. It started from a Rayo corner as Villa arced onto Gerard Pique’s clearance and played a perfect pass to Messi. The 25-year-old spun past a defender before elegantly chipping it over the Rayo goalkeeper and the ball nestled in the back of the net for 3-0. Out of nowhere, Rayo started to come into the game. They pulled a goal back when Alejandro Dominguez crossed low for Tamudo, and the former Espanyol striker rifled in with his first touch after coming on as a substitute. Fan-Athlete Relations… do we have a problem? LeBron and AD, Clippers sliding, Rockets Rising. © 2014 Fanthem.com. All rights reserved.